Juniors and majors softball all-star squads win their divisions at Oregon District 5 Tournament in Redmond. 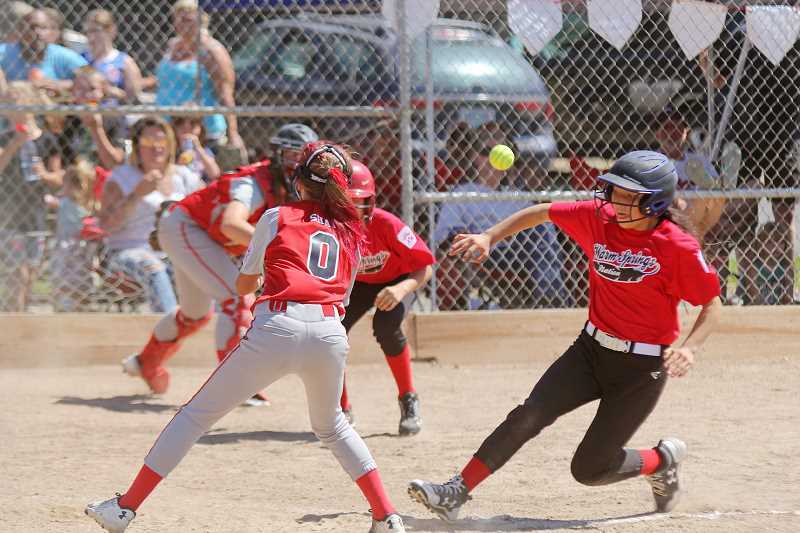 With a balanced combination of offensive firepower and pitching, Warm Springs Nation proved to be an overwhelming opponent in the Little League softball majors division. Warm Springs Nation swept through the three-team bracket with three wins in two days, and earned a berth in the Little League state tournament in Portland July 8. The team began its run on Saturday afternoon against Redmond, and as a sign of things to come, Warm Springs Nation had no shortage of offense. They exploded for 12 runs between the first two innings, and chipped in another five insurance runs in the third inning. Wild pitches allowed baserunner scores from Anissa Anderson and Alexa Martinez, who slid into home to beat the throw. RBIs from Rylan Davis and Hailey Cochran pushed two more runs across, and Davis was able to score while Cochran stole second. On the mound, left-handed pitcher Marilyn Tom got into a groove after the team ceded four runs to Redmond in the first inning. Tom and her defense kept Redmond at bay the rest of the way, and the 12-run margin was enough to end the game after four innings. Warm Springs Nation blew away Crook County 20-4 in the second game of a Saturday doubleheader, which set up a rematch with Redmond in the championship game. Although the 13-8 score was closer than the first game, Warm Springs Nation defeated Redmond and advanced to state. The juniors team overcame a heartbreaking, albeit thrilling, opener in which they lost 4-3 to Redmond despite holding a 3-0 edge heading into the sixth inning. Warm Springs Nation won its next three games — a rematch with Redmond and two against Sisters — to advance to the juniors state tournament in Keizer July 8. The team watched as Redmond lost to Sisters later in the day, and on Sunday, exacted revenge on Redmond with a 14-5 win to eliminate Redmond from the tournament. Warm Springs Nation then beat Sisters 19-6. But, because the loss was Sisters' first in a double-elimination tournament, a rematch on Tuesday decided who would go on to the state tournament. Warm Springs Nation won the second game against Sisters 15-5. The Warm Springs Nation majors baseball team faced a tough opponent in Bend South to begin the tournament Saturday afternoon. After Skytus Smith led off with a single in the top of the first inning, Warm Springs Nation was unable to get anyone else on base. In the bottom of the inning, Bend South scored 13 runs and saw 14 batters appear at the plate. Bend South went on to win 23-0.